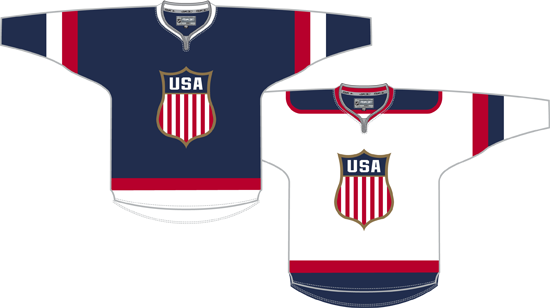 USA Hockey unveiled the jerseys to been worn by the men’s and women’s teams at the 2014 Winter Olympics in Sochi today to much ridicule. Both the blue and the white jerseys feature blue shoulders with sublimated stars printed on them. At the collar is faux-lacing, where what appears to be lacing is simply a printed graphic. On the white jersey the blue shoulders are bordered with a thick red stripe. On the blue jersey this is replaced with a red and a white stripe high on the sleeves. The crest is a modernization of the USA shield worn by early American Olympic entries and seen recently on alternate jerseys. There is no striping on the body of the jersey. As I did with the Red Wings’ Winter Classic jerseys, I’m taking a look at how the elements that went into the final jersey design could have been used to make a better concept. The sublimated stars are removed because they’re a horrible idea. The blue shoulder is retained on the white jersey, however, in the form of a more standard yoke design. The sleeve stripes on the blue jersey are lowered to a more traditional location and mirrored onto the white jersey, where blue swaps for white. Those stripes are also added to the waist of the jersey in another traditional design concept. The shield remains in place but slightly larger. My template doesn’t show it but the jerseys would feature standard lace-up collars. With a handful of changes the 2014 jerseys go from a mish-mash of too-modern ideas to a classic-looking concept. I’ve had a blank editor window open since news broke last night that former Red Wing Shawn Burr had died after suffering massive head injuries from a fall in his home, waiting for words to come to me that would sum up what it meant in some nice little way. That’s not going to happen, of course. Can’t blame me for trying, though. Burr was one of the first Red Wings I remember. Growing up with the team in the mid- to late-1980s and into the early 1990s, it was all about Steve Yzerman, Gerard Gallant, Bob Probert, Joe Kocur and Shawn Burr. Without Gallant or Probert or Burr (but with Kocur back after stints with the Rangers and Canucks) the Red Wings finally found their way to the top of the league but those were the guys we watched pull the team out of the “Dead Wings” era. The people who actually knew him talk about his laugh, his presence in the dressing room. To me he was just toughness personified in a way different from Probert and Kocur. A guy who looked smaller than his height but played bigger than it. Survive cancer for 3 years only to fall down a flight of damn stairs. The fates had to be pretty damned determined to take a guy like Burr. Cancer alone wasn’t enough to stop Burr, that final fall was needed as well. Burr joins the aforementioned Probert – as well as Steve Chiasson, Brad McCrimmon and Marc Potvin – as early-1990s Red Wings gone too soon. Silliness in the face of sadness: Burr, Probert, Vladdie, Chiasson… Damned if the Wings don’t have the most tragic NHL94 roster. And McCrimmon. Worse than I thought. The Detroit Red Wings announced on Thursday that they will raise Nicklas Lidstrom‘s #5 jersey to the rafters in a pre-game ceremony before their March 6, 2014, matchup with the Colorado Avalanche. Lidstrom’s number had been slated to be raised during the 2012-13 season. With the loss of the first half of that season’s schedule due to the NHL’s lockout of its players, the team held off on rescheduling the ceremony so that it wouldn’t be rushed. Lidstrom played his entire 20-season NHL career with the Red Wings before retiring in the summer of 2012. He won the Norris Trophy as the league’s best defenseman seven times in his career, was named to play in eleven All-Star Games, and was the most valuable player of the 2002 Stanley Cup Finals.